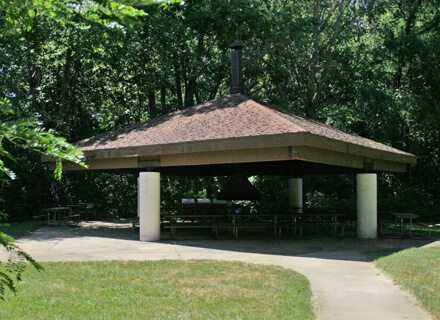 Nestled in the the oxbow of the Elkhart River, this open-air shelter is a fantastic site for a family outing and includes close access to a playground, volleyball court, and is only a short walk to the spillway and fishing sites. Nearby, hiking trails run along the river and through beautiful woodlands. The shelter includes a campfire pit and is handicap-accessible. From the gatehouse, take the first left and continue for a half-mile. After crossing the covered bridge, continue to the next shelter on the left.